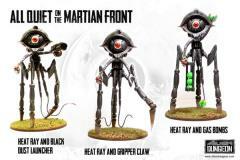 The most common type of Martian Tripod is the assault version. These generally are armed with the iconic Martian weapon, the deadly Heat Ray. However, there are always some among them that are armed with Black Dust launchers or Green Gas grenades. Quick moving, hard to target, and heavily armored, they are difficult to destroy with anything but a direct hit against the main body. This box set contains enough sprues to build three complete Plastic Assault Tripods. You can opt to build one of each variant if you like, or even 3 of the same kind. Miniatures are supplied unpainted and assembled may be required.